Our bookkeeper, Kim, would be very happy if you would order online at www.kansassampler.org/shopping/. Some advantages to ordering online is that your order is recorded, you are notified when the books are shipped, you can track the order, and you can go in to your account and check payments. If this does not work, call 620.585.2374 or e-mail wendee@kansassampler.org to order. There is no minimum number of books to order. To order online and receive the 50% discount off the original $29.95 selling price, you’ll first need to create an account (link is in upper right hand corner of the page), then follow the prompts and have your Tax ID number handy. Choose "I’m a Wholesale Customer” to see the 50% discount price. The book retails for $29.95. As of December 2018, the book can be sold for $24.95. You receive a 50% discount ($14.98). There are 12 books in a box but there is no minimum. Order what works for you. Thirty-day billing. You pay the shipping unless you would like to check with us to see if we can deliver or if there is a book storage center close to you. GET A REAL DEAL ON the 8 Wonders of Kansas Guidebook! 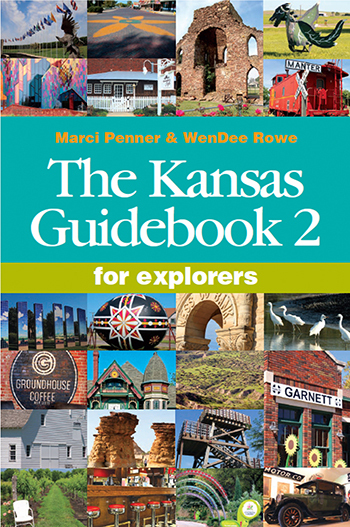 The 8 Wonders of Kansas Guidebook has been out since 2011. The listed retail price is $29.95 but you can sell it at whatever price you’d like. We are now selling the book to you at a 60% discount (you pay us $11.98 and keep $17.98 if you sell it at $29.95). Ten books in a box, no minimum. 30-day billing. The guidebook is currently being sold in more than 240 locally-owned stores across the state. The reason we choose not to sell on Amazon is because that would take away from your sales. We love that you keep 40% of each sale. This is a win for the customer (most comprehensive guidebook of Kansas), a win for the 4,500 places in the book (no charge to be in the book), a win for the bookseller, a win for our printer, Mennonite Press, from Newton, and a win for the Kansas Sampler Foundation (the book helps achieve our mission to preserve and sustain rural culture). We’ve listed all the retail locations on our website. We even hyperlink to your website or social media page so customers can learn more about you. We are a non-profit based out of Inman. Our mission is to preserve and sustain rural culture. The reason we produce guidebooks is that it’s a palatable method to educate the public about Kansas and what it has to offer and about rural culture. It took co-authors Marci Penner and WenDee Rowe parts of four years to go to every one of the 626 incorporated cities in Kansas. It took a year to write the book and we hope to disperse 20,000 books to people eager to know the state within 2½ years. In addition to researching for the guidebook, we also continued to learn, observe, listen and find ways to help sustain communities. We do many projects in addition to the guidebooks. Maybe some of your local boards or corporations need a gift for employees or customers. If they want more than 20, talk to us and maybe we can broker a deal. If you’re doing a special display for the books for the upcoming shopping season, send us a picture and we’ll post it on Facebook with a link to your store! If a customer shares a great story about using the book or plans they have, let us know and we’ll post it!